Today’s video is my favorite in the series. We’ll walk through seven core “conversion improvement strategies”. Most of these strategies look at a specific area to test on your site and it’s these same techniques we’ve used to make gains of over 100% in conversions (both signups and sales) on our sites and with our clients. Missed the two earlier posts? Here are links to the first and second. 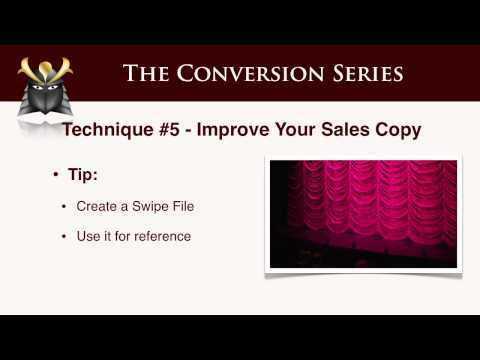 If you missed your copy of the conversion checklist, click here. 1. Space to think – learn how, by carving out just 30 minutes of uninterrupted time to look through your website with “fresh eyes”, you can be your own “high priced consultant”. I’m certain if you’ll do this, you’ll write a long list of solid opportunities for sales growth. 2. Logical flow – in almost every market, you’re dealing with time poor, stressed and “damn busy” prospects. It’s our job to make the journey from a prospect’s first exposure with us through to the sale both logical and free from unnecessary distractions. This may sound obvious, but the internet is full of marketers misdirecting their prospects and wondering why nothing sells. This problem is endemic! We’ll look at how a logical break in your sales process will cripple even the hottest offer and best sales copy. Streamline your website ‘flow’ and give your sales a serious boost. 3. Confusion – I have this mantra scribbled on a pink sticky note below my monitor “the confused prospect doesn’t buy”. This means that before we try to sell anything, we must help our visitor orientate themselves. They must feel comfortable and know where they are. Then when we present our sales message, we must use copy, layouts and graphics that make our message simple to understand. Remember! The dreaded back button is always there, looming at the top of our page and the moment our prospect has to think a little too hard, or work to find something on a page, they’re gone in a click (and they never ever ever come back!). We’ll also look at the different elements of your sales message and how to test them, and I’ll share a handy tip I use to get great copy quickly when consulting with clients. 4. The Power of Specificity – Learn the value of moving from general and ‘easy to dismiss’ sales claims to ‘sit up and take notice’ specific and punchy copy. 5. Upping Your Sales Copy – We’ll discuss techniques you can use to quickly improve your own sales copywriting skills as well as when and how you should consider engaging professional copywriters to help you. 6. Cialdini’s Seven Universal Persuasion Techniques – We take a tour through seven proven and universal human persuasion techniques (each of which can be applied directly to your website to boost conversion). 7. Segregating Channels – Discover how by better matching your message to different market segments, and then duplicating your most profitable segments, you can systematically increase profits. Robert Cialdini, is, in my view, one of the great writers on the topic of persuasion. If you’ve not read his book “Influence”, I highly recommend it. Next Post: Take the “30 Minute Site Review Challenge” and Win a Free Website Critique! Look out for our final post in this series in a few days time. We’ll release the last video and have some fun giving away three free website consults by the Samurai founders. Hope you’re enjoying the series, and you’re seeing a dozen ways turn your lazy old websites into profit-pumping systems. P.S. – Take a quick look at your site for a moment. If you’re feeling brave, post a link to it in the comments and tell us in one sentence what single tweak you’d like to test to boost sales? P.P.S. – As always, if you’ve found this free series helpful, ‘share the love’ a little by clicking the “Like” button above.